1/4 Cup assorted candies of your choice. Layer Ridgies Original Chips on a parchment-lined baking sheet and sprinkle with popcorn. Coarsely chop chocolate and place three-fourths into a microwave-safe bowl. Microwave on high 1 minute and stir until smooth. 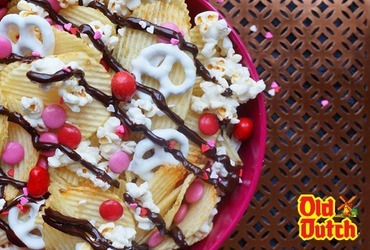 Drizzle chocolate onto chips and popcorn then sprinkle with chocolate covered pretzels and your choice of assorted candies. Allow to set 1 1/2 hours, then serve, and enjoy!